Over a cup of tea, Gabrielle recounted her dream. The details are a bit blurry but, in essence, she was preparing a meal for me of fried bees in honey sauce and somehow the bees had ended up in the compost bin and I was getting increasingly annoyed as she tried to rescue these cooked bees whilst flirting, even kissing, downsizer-turned-celebrity-farmer and TV chef Hugh Fearnley Whittingstall. Amongst my readers, are there any Jungian psychoanalysts who could shed any light on this? Should I be worried? Should HFW be worried? What do the fried bees signify? Grey squirrels were introduced to the UK from the USA in the late 19th or early 20th century. Now widespread throughout England and Wales, and some parts of Scotland, they are absent from France and the rest of mainland Europe except for a few scoiattoli grigi in Italy. The sting in their bushy tail is that they are notorious for displacing red squirrels. These impostors out-compete the native reds for food, can digest acorns, which the reds can't and also carry a virus, which does not affect them but is deadly to the reds. 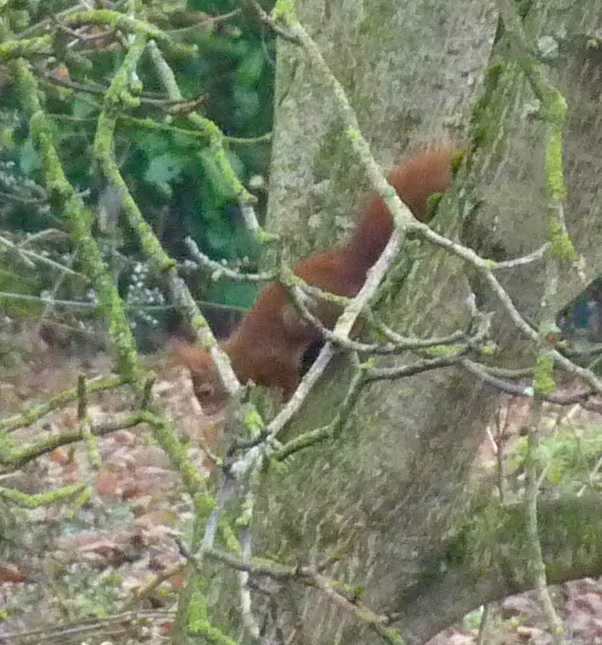 So, you see, we have a healthy population of red squirrels which always cause a ripple of pleasure when we spot one bouncing round the limbs of adjacent trees. I haven’t the telephoto lenses, skills and patience of a wildlife photographer, so I was happy to grab this image the other morning. 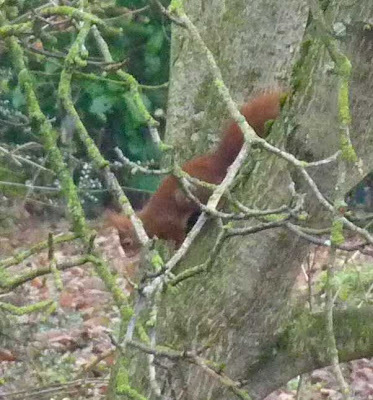 Grey squirrels can be cute too but there’s something especially optimistic about a red squirrel with his Tufty ears and russet coat, a warm dab of rouge on a grey winter’s landscape. Incidentally, I once ate a grey squirrel, cooked by a tramp over an open fire in Chichester … it tasted a bit like chicken. Considering the damage they are doing to woodlands, I think it should be a duty of meat-eaters (I’ll spare the vegetarians) to eat a grey squirrel a month. Don’t turn your nose up: it’s free range, organic and would help to preserve trees. Next up : I promise a more sensible blog as we plan and start planting our forest garden and building our Warré beehive. Eat grey squirrel. Have you heard about the new (slightly tongue in cheek I suspect) diet - invasivores? It means eating invasive species! Invasive species? Shoot on sight! Nothing worse for any ecosystem than an invasive. Where I live, Florida USA, is the capital of invasive stuff!